There are few things better than the ultimate comfort food—macaroni and cheese. This delightfully creamy noodle and cheese concoction is served up in all varieties at Louisiana’s great eateries. 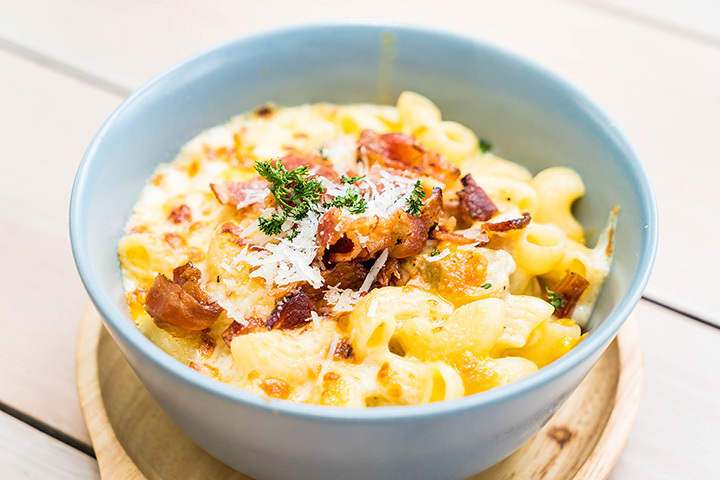 Whether you prefer something traditional or an option made with a little something extra, here are the best places for mac and cheese in the state! You only have to look at the number of awards and recognition earned by Cochon Butcher to get the idea you’re dealing with something special. Located in the industrial section of the city, Cochon Butcher is New Orleans’ restaurant to talk about. This place is the real deal, offering, no demanding that attention and respect be paid to the humble food that makes Southern Louisiana what it is. The innovative approach taken by the two master chefs who operate this dining establishment create a balance between the old and the new. These chefs gather ingredients from local sources and bring balance to authentic Cajun-inspired dishes like their house-made macaroni and cheese, made with pancetta, mushrooms, leeks, a combination of sharp and mild cheddar cheeses, and white wine, then topped with herbed breadcrumbs and aged provolone. Don’t be surprised by the casual look of this place, and let the food of Chef Ron’s Gumbo Soup speak for itself. Located in Metairie, Louisiana, Chef Ron’s serves some seriously good gumbo and other Cajun/Creole classics like crawfish étouffée and Chicken & Sausage gumbo. His sides aren’t bad either and are the perfect addition to the star of the meal. Try the mustard greens, Cheesy Mac, red beans, and jambalaya with your main course. Catering is available, too, and the restaurant is open every day but Sunday from 11 a.m. until 9 p.m.
O’Briens Grill in Terrytown, Louisiana, opened in 2008 with the purpose of providing hungry diners a place that offered good food, good service, and a classy experience. To make it even better, the chefs who prepare the food know how to incorporate the best of Cajun and Creole flavors to create award-winning masterpieces. Take the Crawfish Boil Risotto for example, made with assorted crawfish, potatoes, corn, onions, andouille sausage, and garlic, or the truffle mac and cheese. Open every day except Sunday, but reservations are recommended, especially on Friday nights. It’s worth going to Social Southern Table & Bar in Lafayette just to enjoy the atmosphere and watch the bartenders mix drinks, and with the founding concept to be real and eat good, great food is a given. The name says it all, actually, and there’s an innate understanding that food is part of being social. Whether you come alone, with friends, or someone special, the hope is that you’ll leave with a full belly and more good in your world. Open for lunch, dinner, drinks, and brunch on Sundays, you’ll find fresh locally sourced ingredients to be part of everything you try. Make sure to try the mac-n-cheese, made with blistered pepper, sake, and aged white cheddar. If you’ve never been to a rum house, this is the one to try. With a location in Baton Rouge and one in downtown New Orleans, the Rum House is a lively place where you can have great food and fun in the same place. Known for their amazing tacos, they’re much more than just tacos. Their mac and cheese side is absolutely delicious and complements just about anything on their menu! Eating at Mama Reta’s Kitchen in Lake Charles, Louisiana is like eating at grandma’s house. With a great menu of comfort food like fried chicken, gumbo, and black-eyed peas, smothered cabbage, and of course, mac & cheese, you can dine in or take it home. There are lunch specials daily, and you can’t beat the prices at this family-owned diner. According to several social media sites, Pamela’s Bayou in a Bowl in Alexandria, Louisiana is a great place to eat, hands down. It’s a big boast to infer that you can sum up the unique taste of the bayou in a bowl, but if anyone can do it, Pamela’s can. This truly is a taste of Louisiana’s best, and their mac and cheese is totally to die for. Open every day for great Southern food served family style. Bells are ringing at Cowbell, New Orleans’ answer to great food. Simply good food at reasonable prices. That’s what you’ll find at Cowbell’s and that’s worth ringing the bell for. You have to try the crawfish mac & cheese. One of the house signature dishes, they add a little extra to their original mac and cheese. You won’t have to argue with you kids to finish their dinner if you take them to Rocky & Carlo’s Restaurant in Chalmette, Louisiana. Large portions and down-home food like mac and cheese are considered standards here. And speaking of mac and cheese, try that as a side to one of their famously yummy po-boys and you’ve got a meal made in heaven. Stop by any day except Sunday and Monday for some of the South’s best Cajun/Creole combos. As a family-owned and operated Mandeville restaurant, Pontchartrain Po-Boys works hard to serve the biggest and best platters of delicious food guaranteed to fill your belly and satisfy your hunger. Only open during the week, you can dine in or call ahead for pickup, and whatever you order as your main dish, there are sides like hand-battered onion rings, house made gumbo, and baked macaroni and cheese. And finish your meal with their signature bread pudding with rum sauce.